As usual I was awake several times for quite some time. I've strated believing it has to do with the height. 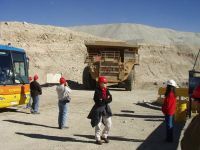 The tour around the biggest open mine in the world started 8.30 a.m. at an address in town. I asked my officer how long it would take me to walk there, I had already made the deal that my bike could stay. If not the police could look after it, who could? He wanted me to wait 'un rato'. I thought it was because I was going to say hello to the successor who was expected at 8.00 a.m., but I was going to be driven there. The police is serviceminded here. When I look at the damages from yesterday, I've got off with light abrasions on the knees, two half sprained fingers, damaged nails and a nonfunctioning rear pannier. The last is the worst. During the visit in the mine we get at 2780 m. As it is with those tours all the nonsense you hear is trivial, but the VISUAL IMPRESSIONS are overwhelming. After the visit there's a lady and some little girls with a videocamera that want me to do something. At first I think I have to videotape them together, but it's ME they're going to film. She's the teacher and now the girls will have to show their english and I'm the target. They ask questions as best they can and I answer back in spanish, I'm not sure that was the purpose. When this brilliant interview about my name, age etc. is over, I see an opportunity to get a ride back, but they're not going there. God only knows where they're then going? The yellow taxis only go to Calama, so I walk the one and a half mile in the dusty heat. I pack after a new concept. The new officer comes to talk, while I'm packing. Want to know why people comes to visit Chile? I try to explain some of my impressions for him, but he's not convinced. I would like to add that I don't think I ever go to Chuqui again and that I find his job in such a dusty town to be little to envy. I roll all the way back to Calama, but with the brakes on a part of the way. Calama is nothing to write about, but I find a bike shop and the owner helps me to buy one second glue and get to parts together. The opening/closing mechanism is too vulnerable for this. but by the help of a wire I carry for such occasions I get the pannier back in position. Tomorrow it will be tested. He has also talk to the german who came from Bolivia, and went down south, but that his name should be Jeff, he didn't know. He doesn't think it will be impossible to go to Ollagüe by bike and goes through the route for me in detail, but I have decided to go by this train. It should be a experience of the less comfortable. It's a matter of a ulimited time agreement to take passengers from Chile to Bolivia. This results ina deficit, so they don't maintain the trains much. I'll probably have to sit in my sleeping bag most of the way. It takes about 24 hours and costs 7.000 without the bike. But I can bring it. Unfortunately they are serious about the siesta here, and besides it's saturday but I hope they open at 5.30 p.m. I need some informations and want to work out a new stock of 'alimentos'. I set off at 8.15 a.m. The last quarter is used for trying out different solutions for the luggage. This has been my best lodge in Chile, when we forget about my luxuory trip in Los Molles. She asked for 7.000. I such a situation I speak danish. The tone of the voice is best utilized this way. Just for one night? Yes, now. But I'll return from San Pedro. Well, 5.000 then. Top. There are two rooms here across the yard. In the corridor is a sink so together with my little cooker it's a whole kitchen. The TV er here too, so it can be watched from both rooms when the doors are open. There are a lot of channels, so they have a parabol. I find CNN and watch about a tragic accident in Ukraine at an airplane show. Nice tile floor. Only one minor whole in the wall and a disgusting curtain spoils the good feeling. It's a rough start. Head wind and climbing. But as the bike-man said (about Ollagüe) you have to leave early because all morning the wind comes from the mountains. At the dumping ground an army of dogs come barking towards me. They're having a bad fortune here. Last stop before death. Later I see something moving in the road ahead, then it runs away. Up with the binoculars. It's too far away. But the animal stands still. Yes, the fox tail is clearly seen. It's this dessert fox I've seen before. The day has already improved and the wind is more from aside. As I pass some mountains to my right, three cars are parked. Here's the surface that hard and plane that even normal cars can go there. Behind the mountain is another and on top I see what's going on. Paragliders. The wind has lower already and our friend doesn't have a long glide. Just down the foot of the mountain (200 m high I guess). He's been out here early I hope. Now it's almost up and at the same time I hear the explosions in Chuqui. Distant roars. At night I took it to be thunder. At 21 km I stop and watch the landscape. Flat plain around me. At the east the high Andes throne in the mist. The shocking effect from the other day is gone, but they're impressing as they lie there, growing from the flat plain. Maybe some lower ones in front, if so there're hidden in mist. At north east more summits can be seen and at south east a distant giants cone override the ridge I have to cross later in the day. To the west are only some very low brown mountains, which cuts the area off from the valleys behind. The giant must be Llacancabur. At the west I see a lake there in front of the mountains in the horizon. Actually it's like the horizon disappears for some distance and two smaller tops seem to hang above the "water". Mirage, fata morgana. It's 0.10 p.m. and I've come quite a distance, 43,5 km. The shoulder that was missing at first reappeared suddenly after 10 km. I wondered, but get the explanation later. After 35 km the workers have a depot, where they also dig gravel to put on the soft asphalt, and from here they work their way. And they work even on a sunday. A car stops a little ahead and from the right side an arm holds a small bottle. I get there and even I hint that I have beverages myself, I receive gratefully this gesture. The wind has grown again but now it's almost in my tail. and that makes the difference from 9-10 km/h to 14-15 km/h. Just when it all gets a bit boring, my eye is catched by something moving to the left, and really, a larger animal is walking 50-75 m from the road. I succeed taking one picture, where it certainly will just be a dot, but through the binoculars it looks great. All alone. I thought them to move in groups or families, but what specie is it? Lama, guanaco or vicuña? Not the first one, but I believe there's a picture of one in my book on Bolivia. (Now I know it's a vicuña, there's a picture on the screen I'm sitting at, and I havee asked!). I feel I'm just holding my pace but all of a sudden my breathing have entered a dragging rytmn. It has started inclining towards the ridge I have to pass, but THAT much? But a glance at the altimeter tells it all: 2875 m. I slow down, I have to be ready for the afternoon too. From 13 km/h to 10 km/h. It's a hard distance I'm climbing. The ridge I have to cross have for some time been hidden behind the gradient on which I am, but here it comes again, so the road is flattening? - hurra! I'm puzzled by a tree at the road, there have been these dry tauts, but a tree? A sign tells the story: 'Dame agua, por favor!' And someone has to stop. Where is my extra supply? I won't pass without donating some. Clouds cover the sun from time to time, and a blessed wind pushes my back, and even then it's hard. 3205 m at the meter. It hasn't been adjusted since Baquedano. For long I've seen the white line on the ridge ahead, and I decide that that's where I'll eat my lunch at 2.00 p.m. In a way it doesn't matter where or when I eat lunch but doing this hard work I need something to look forward to not to break down. Now I realize I won't make it, but never mind, it's not far. 2.20 p.m. I'm at the barrier. Time for fluid, rest and wellness. Recently I saw something white over to the left. After having watched for some time I'm in no doubt: snow.Almost a month ago I heard, in Los Molles I think, that snow had fallen in San Pedro, and here after all this time, the slope still hides it from the sun. But it also tells about temperatures up here in the pass. To get moving again after every little break is an experience. Especially this time. Encouraged by food and water I start out quick, just to feel after 20 m, how something expected to run down my legs, doesn't. It's like they cruble away beneath me and the speed have to be lowered to the slowest possible 5-6 km/h. On top the road has been cut through the ridge for the last 10 m and just here lands a big bird in front of me at a distance of 50 m. Unfortunately a car comes from behind in that moment, but in the flight I can see it's white underneath the wings but the rest is black. I think it belongs to the jote-family, there are probably more species. After the ridge the landscape flatten and the meter stops at 3410 m. In a bus shelter, the only one in these 100 km, I sit for a while protected from the howling wind, which has pushed me gently lately. It's pretty flat for quite a distance - surprising, I just thought I was going down. But after some time it comes, the descent. And once again I'm surprised. In my imagination it would be from 3000 to 2600 m, but I ended up in 3410 m and when I look in the map, I have to go down to 2200 m. A difference of 1200 m! So, down it goes! The road is not perfect, so I stay at 50 km/h. Stop to get my HH jacket on. And down, down, down it goes. And even now I think of how on earth I ever will go UP this way. When the descent ends and the legs have to get moving, it's as if they refuse, and the road inclines, it's not much, but with legs like these! I thought I was just going down to San Pedro, but no. After some pieces of chocolate, it helps and I crawl across a gradient. It's the area called Valle de la Luna, The moon valley, and here are some interessting formations even it's not the valley itself I'm going. But then it comes! When I in the end gets to the top, I go down again in a swirling speed, and first comes some interesting formations to the right, but a moment later the most fascinating landscape I've ever seen. Ravines have cut out this landscape. It has the color of red bricks. It has been eroded to the most fantastic jags and spikes. A long row of jags to the right reminds me of the back of a overdimensioned comb lizard. This is worth all the hard work. I brake through this area and reach eventually San Pedro de Atacama! Another goal. It's around 5.30 p.m.
Another surprise: the asphalt road ends outside of town. 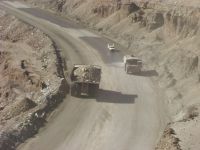 Here they don't use asphalt. Very rustic. Reminds me of towns in the East: India and Nepal. It looks like mud built houses which it maybe is. The town is not big. It's a tourist trap and a flipper town. Behind the mudbuilt houses walls are modern installations at modern prices and a bit. Lots of lodges, but all complete the first 4 of them. The first I passed, but which I thought was too shabby, shows to be with private shower at a price of 12.000 And later I find one at 18.000. The glued pannier is ruined again so now it touches the rear wheel. Suddenly I'm standing at 'Sernatur' the state tourist office which by a miracle is opening this sunday evening at 6 p.m. She can't help much. There are a couple of lodges with prices I'm willing to pay, but when they're full it doesn't help. In the end I reach a spot with the word Camping too, so now I've for the first time put up my tent in darkness. Here are only youngsters. 2000 for a night. My next problem is: what can be bought in this town? But they have internet connection.